PM #40762529 $5.00 • Vol. 29, No. 33 October 22, 2018 L AW TIMES C O V E R I N G O N T A R I O ' S L E G A L S C E N E • W W W . L A W T I M E S N E W S . C O M Pot legalization could spike human rights complaints Doug MacLeod says cannabis-related addiction could become a 'staple claim' in employee termination cases before Ontario courts and tribunals. Photo: Robin Kuniski PAY EQUITY Systemic discrimination addressed P5 BENJAMIN ORDERS Rare remedy, but necessary to have P7 FOCUS ON Trusts & Estates Law P8 BY ANITA BALAKRISHNAN Law Times L awyers could see an uptick in human rights complaints related to cannabis after the legalization of recreational use on Oct. 17, although the prov- ince of Ontario says that human rights protections for people with disabilities or addictions remain the same as before. 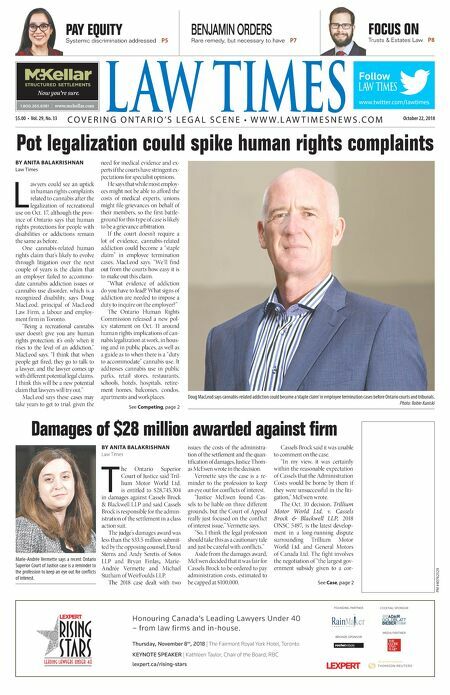 One cannabis-related human rights claim that's likely to evolve through litigation over the next couple of years is the claim that an employer failed to accommo- date cannabis addiction issues or cannabis use disorder, which is a recognized disability, says Doug MacLeod, principal of MacLeod Law Firm, a labour and employ- ment firm in Toronto. "Being a recreational cannabis user doesn't give you any human rights protection; it's only when it rises to the level of an addiction," MacLeod says. "I think that when people get fired, they go to talk to a lawyer, and the lawyer comes up with different potential legal claims. I think this will be a new potential claim that lawyers will try out." MacLeod says these cases may take years to get to trial, given the need for medical evidence and ex- perts if the courts have stringent ex- pectations for specialist opinions. He says that while most employ- ees might not be able to afford the costs of medical experts, unions might file grievances on behalf of their members, so the first battle- ground for this type of case is likely to be a grievance arbitration. If the court doesn't require a lot of evidence, cannabis-related addiction could become a "staple claim" in employee termination cases, MacLeod says. "We'll find out from the courts how easy it is to make out this claim. "What evidence of addiction do you have to lead? What signs of addiction are needed to impose a duty to inquire on the employer?" The Ontario Human Rights Commission released a new pol- icy statement on Oct. 11 around human rights implications of can- nabis legalization at work, in hous- ing and in public places, as well as a guide as to when there is a "duty to accommodate" cannabis use. It addresses cannabis use in public parks, retail stores, restaurants, schools, hotels, hospitals, retire- ment homes, balconies, condos, apartments and workplaces. See Competing, page 2 Damages of $28 million awarded against firm BY ANITA BALAKRISHNAN Law Times T he Ontario Superior Court of Justice said Tril- lium Motor World Ltd. is entitled to $28,745,304 in damages against Cassels Brock & Blackwell LLP and said Cassels Brock is responsible for the admin- istration of the settlement in a class action suit. The judge's damages award was less than the $33.5 million submit- ted by the opposing counsel, David Sterns and Andy Seretis of Sotos LLP and Bryan Finlay, Marie- Andrée Vermette and Michael Statham of WeirFoulds LLP. The 2018 case dealt with two issues: the costs of the administra- tion of the settlement and the quan- tification of damages, Justice Thom- as McEwen wrote in the decision. Vermette says the case is a re- minder to the profession to keep an eye out for conf licts of interest. "Justice McEwen found Cas- sels to be liable on three different grounds, but the Court of Appeal really just focused on the conf lict of interest issue," Vermette says. "So, I think the legal profession should take this as a cautionary tale and just be careful with conf licts." Aside from the damages award, McEwen decided that it was fair for Cassels Brock to be ordered to pay administration costs, estimated to be capped at $100,000. Cassels Brock said it was unable to comment on the case. "In my view, it was certainly within the reasonable expectation of Cassels that the Administration Costs would be borne by them if they were unsuccessful in the liti- gation," McEwen wrote. The Oct. 10 decision, Trillium Motor World Ltd. v. Cassels Brock & Blackwell LLP, 2018 ONSC 5497, is the latest develop- ment in a long-running dispute surrounding Trillium Motor World Ltd. and General Motors of Canada Ltd. The fight involves the negotiation of "the largest gov- ernment subsidy given to a cor- See Case, page 2 www.twitter.com/lawtimes Follow & $#&!&jmmm$cYa[bbWh$Yec ntitled-4 1 12-03-20 10:44 AM FOUNDING PARTNER COCKTAIL SPONSOR BRONZE SPONSOR THE E B O L G AND MAIL MEDIA PARTNER Honouring Canada's Leading Lawyers Under 40 – from law firms and in-house. Thursday, November 8 th , 2018 | The Fairmont Royal York Hotel, Toronto KEYNOTE SPEAKER | Kathleen Taylor, Chair of the Board, RBC lexpert.ca/rising-stars Untitled-2 1 2018-10-16 9:27 AM Marie-Andrée Vermette says a recent Ontario Superior Court of Justice case is a reminder to the profession to keep an eye out for conflicts of interest.